I had some spare time to read so grabbed this book for the first ever re-read of it. I had picked up the first 3 parts in a charity shop years ago on a whim and raced through them. I then found the last 3 on ebay, paying I seem to remember more than cover price for the final part as it was pretty hard to find at the time. I had enjoyed it, and it was around the period I had heard of some Song of Ice and Fire series. Couldn’t find that anywhere though and wasn’t paying the, what seemed to be extortionate fees to get it second hand/via ebay. I remember speaking about the book series years later to someone at work and us both discussing one particular scene which was pretty horrifying/distressing. He said he had felt similarly. His brother upon reaching the paragraph hurled the book across the room. I look forward to reaching that part again. But enough set up. The book starts off as a standard fantasy fare. Orphan boy in a town beset by Viking like raiders. It evolves into a coming of age and almost heroes quest along the way. As well as taking the usual fantasy tropes of monsters in the woods and his take on elves and dwarves. Just this description alone does not do it justice. This isn’t some fantasy paint by numbers, or drek of the level of a D&D novel or Magic storyline. Nor is it someone just trying to re-tell Tolkien. It’s more like someone trying to write in the manner of Tolkien. Trying to tell a tale that has been written far in our past. Although the small snippet you see in book 1 makes you think it is somewhere near the the UK/Ireland with maybe Vikings raiding, from the appendix though it reads as if it is the Western seaboard of the US with the raiders being from Siberia. This isn’t clear from the book alone though so I may clarify after reading it all again. Creating a whole world and mythology. Sprinkling elements of lost languages and lore. 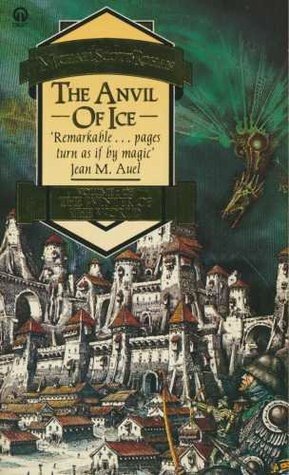 The threat from the coming ice, years before GRRM finished his first book. But the most important part and detail is the central storyline of Alv (later Elof) learning magesmithing. Detail is given of his journey as an apprentice and later journeyman smith. Of mixing blacksmithing with magery. Weaving spells into the objects he creates and the power imbued, drawing on at the time unknown skills and abilities he hasn’t fully unleashed or understood. The book ends on a solid note, with the set up clear for the next. You understand the main characters journey is far from over and the world building and mythology of his story desperately leaves you pining for the next volume. I remember on my first read I was finding myself up until 2-3 am reading just unable to put it down. I think I raced through those first 3 books with a speed I only matched later on my first read through of A Song of Ice and Fire . On the first internet trawl in years I notice his website is still as woefully out of date as I remember it. One bizarre note is that a company is saying they have the licence to work on an RPG of the series. This post though is a year old and appears to be the last public communication from the company on their site. They do appear to have released a sneak peak at it though.